LAN-CHOO is synonymous to quality small leaf tea with its smooth, mild blend. This product is a stapleless tea bag in a paper envelope making it ideal for use in social channels. Comes in inners of 100s. Making large volumes of tea can be costly and messy. 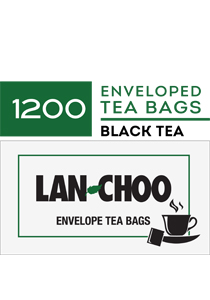 LAN-CHOO offers the affordable one-step tea preparation for urns and single cups. Well-loved tea brand at great value for money. Place one tea bag for each person in a cup. Pour in fresh boiling water. Allow to infuse for 2-3 minutes. Add sugar or milk as desired.